The creamy texture of Photoderm MAX Cream with color leaves the skin a sensation of extreme softness. 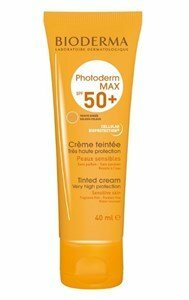 Photoderm Max spf50 +, cream: Rich texture, with color that when applied, does not leave the skin with an oily feeling or with white markings. The maximum effectiveness and anti-UVB the incomparable performance anti-UVA of Photoderm MAX Cream with color protects safely against sunburn, sun intolerance reactions prevents and combats premature skin aging. With color, can be used as make up base.